RAIN failed to dampen a solemn memorial service co-ordinated by Jubilee Australia outside the Hyatt Regency Coolum for the start of the Commonwealth Heads of Government Meeting (CHOGM) on March 2. 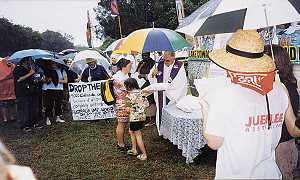 During the service, about 100 peaceful protesters called on the Australian Government to cancel the debt of poorer Commonwealth countries. It was led by Australian Columban Father Brian Gore, who was once jailed by Ferdinand Marcos in the Philippines for his support for the poor. Fr Gore said people came from throughout south-east Queensland. ‘More than 19,000 children die every day because Commonwealth countries who service their national debt take money away from health services,’ he said. Two representatives from Federal Foreign Affairs Minister Alexander Downer’s office were presented with 14,000 CHOGM postcards which called for the cancellation of Third World debt.